Portugal is dry in the south and wet in the north. It has an excellent Roman garden, at Coimbra, and a series of distinctive gardens elsewhere. Many date from the age of greatness when the focus of world trade was shifting from the Mediterranean to the Atlantic. These gardens are late-renaissance and early-baroque. Ponte de Lima has an annual International Garden Festival. Some tour companies take visitors to Portugal. The country has a well developed tourist industry and is comparatively easy for the independent traveller. It is one of of the cheapest countries in Europe for car hire. Bus and train are possible but more difficult. Travel is most comfortable in spring and autumn. Explore the lush gardens of the island of Madeira with one of the UK's top garden designer, writer and TV presenters: Joe Swift. 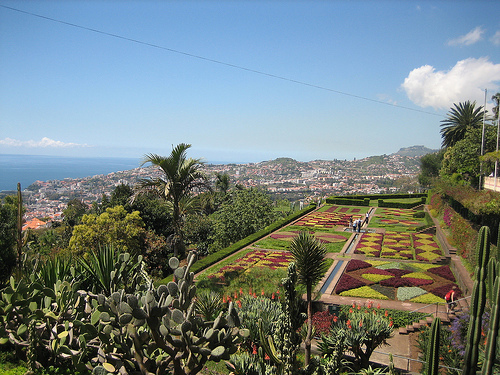 Visit Monte Palace, Quinta do Palheiro, and Jardim Botanico da Madeira (pictured left - image copyright luisvilla).